Sometimes, this is my favorite ship. Sometimes, I hate this ship. It's frustrating. So, My original plan was to make this a Vulcan / Starfleet hybrid - with a Starfleet feel, but Vulcan shape and annular warp drive. ...That didn't work. The rings never looked right. But, the point of the keel was to be the ring pylon (sort of an inverted XCV-330). The main human-ness of this ship is in the really obvious nautical influence. After all, what's more human than a sail boat? The top deck is even supposed to seem like it has planks. The main hull, keel and general feel of the ship all look like someone built a really futuristic sloop. The interesting thing is that the sailing design fits really well with the fusiform ships that the Vulcans would have designed, so it was a double-win! But, the rings didn't work. So, I had to add nacelles; and the ship went from being whimsical and Vulcan to being a tough little exploration ship. Oddly, this is the first ship I've ever drawn where I didn't draw the nacelles first and after this one, the nacelles have come last in everything I've drawn (or started drawing). The nacelles being mounted close to the hull is a design idea that I'm still not sure I like. On one hand, it fits the general idea of a tough little ship. On the other hand, they cover a lot of the ship up and steer perilously close to that cramped and crumpled-up feeling that a lot of my ships struggle with. But, from the forward view, they line up so nicely with the deflector dish! I dunno. This is one reason why I bounce between liking and not liking this design. I really like the nacelles themselves. The Bussard collector interior is a sphere filled with the sub-light engine parts from the Shadowfax and I think they do a better job here. And, I like the general, slightly curved shape of the nacelle. A lot of the detailing is ripped straight from MadKoiFish work (but, let's be honest, that's no crime) I also like the vertically oriented landing bay. I understand why they're not used often, but I think it works wonderfully here. I think my favorite part of this ship is the impulse drive and the greeble between the drive housings. The drive shape is not at all like any Trek ship (and is actually stolen from the Polaris (whatever happened to that movie? )), but the general idea is close enough that you can tell what they are. 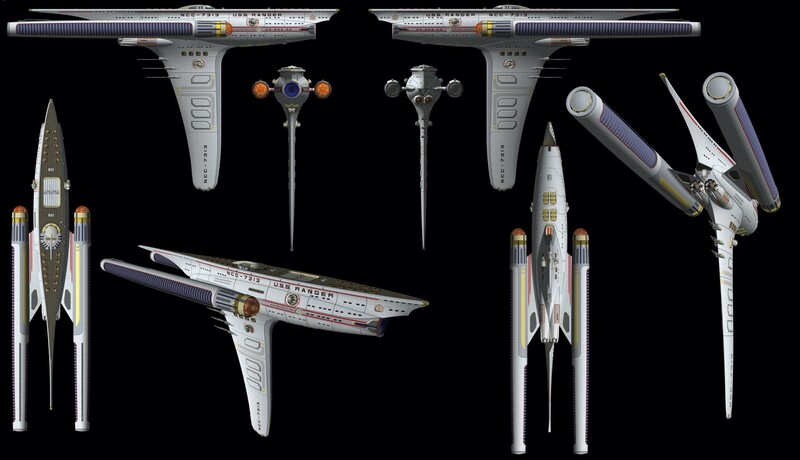 Also, if you download the model, you can see that there is a pattern at the back of each thrust housing that is taken from the Excelsior, but that's more of a Easter egg than i intended it to be. Another part that I like is the stripe that extends from around the deflector dish and back to the nacelle pylon. I have NO IDEA why I didn't have it include the pylon... It would have been perfect! But, I only thought about it after all of the cutting had been done. (those grooves took forever because I didn't know what I was doing) I also added a lot more detail that is necessary for the transporter antennas. It was just an experiment on my part, so , not a big deal either way. This is the first ship that I think I windowed well. The windows are a reasonable size. They're probably still too plentiful, but not egregiously so. This is also the first ship where I intentionally didn't break at a curved edge. In sketchup, you can't smoothly curve from one component to another. So, if you break your component at a curved edge, you'll end up with a visible line. I went through the trouble of making sure that all of my curved components were broken in the middle of flat planes so that those lines wouldn't appear. There are a lot of curves in this ship, so it was a bit of an undertaking. Which brings me to some drawbacks. This ship is WAY too high-poly for the level of detail it has. It's totally unnecessary. It is organic and it's kind of neat that you can't see the polys for the most part, but doing that "no edges" thing in the curved sections took for freaking ever because of the unnecessary poly-count. My least favorite design detail is the escape pods. The design of them is my random doodle, and that never bodes well... In the future, I'll do better. The spire at the back end is uselessly thin. That was a leftover from my poor modeling skills, but I couldn't put the formation light all the way at the back like I wanted because it wouldn't fit. I could have done a better job with the phasers. I don't like standard trek phasers, so I wanted to make something more like a turret, but I don't think my design is well-executed. It's based off of Scifiwarships' principles of turret design, and there are some good aspects, but it wasn't great for a first shot. And, lastly, I can't stand the texturing. Looks like a lot of hard work went into this.